The Moody Blues formed on 4 May 1964, in Erdington, Warwickshire near Birmingham. Ray Thomas, a juvenile John Lodge and (occasionally) Mike Pinder had been members of El Riot & the Rebels. They disbanded when Lodge, the youngest member, went to technical college and Pinder joined the army. Pinder then rejoined Thomas to form the Krew Cats. Back from a disappointing spell in the Hamburg region a few months later, the pair recruited guitarist/vocalist Denny Laine, band manager-turned-drummer Graeme Edge and bassist Clint Warwick. The five appeared as the Moody Blues for the first time in Birmingham in 1964. The name developed from a hoped-for sponsorship from the M&B Brewery which failed to materialise, the band calling themselves both "The M Bs" and "The M B Five" and was also a subtle reference to the Duke Ellington song, "Mood Indigo". Around this time the band were the resident group at the Carlton Ballroom, later to become rock music venue Mothers on Erdington High Street. The band soon obtained a London-based management company, 'Ridgepride', formed by Alex Murray (Alex Wharton), who had been in the A&R division of Decca Records. Their recording contract was signed in the spring of 1964 with Ridgepride, which then leased their recordings to Decca. They released a single, "Steal Your Heart Away", that year which failed to chart. They also appeared on the cult TV programme Ready Steady Go! singing the uptempo 'B' side "Lose Your Money (But Don't Lose your Mind)". But it was their second single, "Go Now" (released later that year), that launched their career, being promoted on TV with one of the first purpose-made promotional films in the pop era, produced and directed by Alex Wharton. The single became a hit in Britain (where it remains their only Number 1 single) and in the United States, where it reached No. 10. The band encountered management problems after the chart-topping hit and subsequently signed to Decca Records in the UK (London Records in the US) directly as recording artists. A four track extended play release titled: "The Moody Blues" featuring both sides of their first two Decca singles was issued in a colour picture sleeve in early 1965. Their debut album The Magnificent Moodies, produced by Denny Cordell with a strong Merseybeat/R&B flavour, was released on Decca in mono only in 1965. It contained the hit single together with one side of classic R&B covers, and a second side with four Laine-Pinder originals. Alex Wharton left the management firm and the group released a series of relatively unsuccessful singles. They enjoyed a minor British hit with a cover of "I Don't Want To Go on Without You" (No. 33) in February 1965, while the Pinder-Laine original "From the Bottom of My Heart (I Love You)" produced by Denny Cordell (with a vocal choral sound towards the conclusion that anticipated their sound on "Nights in White Satin") was issued as a UK single in May 1965 and did a little better (No. 22). But then "Everyday", another Pinder-Laine song, stalled at No. 44 in October 1965 and no further British singles were released for about a year. The group was still in demand for live gigs, though, and they had chart success in the US and in Europe during those months when "Bye Bye Bird" (Decca AT 15048) was lifted from their album in December 1965 as an overseas single in France (No. 3). In June 1966, Warwick retired from the group and the music business. He was briefly replaced by Rod Clark (born Rodney Clark, 23 November 1942, Surlingham, near Norwich, Norfolk), but in early October, Denny Laine also departed from the group, which made Decca release "Boulevard de la Madeleine" c/w "This is My House (But Nobody Calls)" (Decca F 12498, 1966) only a few days later, as the Moody Blues seemed to be disintegrating. Clark joined the Rockin Berries. In the November 1966 issue of Hit Week, Dutch interviewers Hans van Rij and Emie Havers presented their story, saying the Moody Blues had been in the process of recording their second album, Look Out, with Cordell producing. The album was not to be and "Really Haven't Got the Time" (released as a single c/w "Fly Me High" some months later) is the only song mentioned in the article but the authors say Laine had written all of the material, with Thomas, Pinder and Clark (still the bass player) singing lead vocals as well. A final 'Mark One' Moodies single, Pinder-Laine's "Life's Not Life", was scheduled for release in January 1967 (Decca F 12543) c/w "He Can Win" even though Laine couldn't perform it live because the group had relaunched themselves without him months ago. (This single's release is often listed as being cancelled; however, both promo and regular stock copies have been seen over the years). The group re-formed in November 1966. By then, "Boulevard de la Madeleine" had made the Belgian charts and won them more fans, which came in handy when they relocated to Belgium for some time. The new members were John Lodge, their bassist from El Riot, and Justin Hayward, formerly of the Wilde Three. Hayward was recommended to Pinder by Eric Burdon of the Animals and was endorsed by famed UK singer Marty Wilde, the leader of the Wilde Three. Pinder phoned Hayward after reading his lead guitarist letter, and was impressed when Hayward played him his 45 rpm single "London is Behind Me" during their car ride to meet the other members in Esher. After financial misfortune and a confrontation with an audience member, the band soon realised that their style of American blues covers and novelty tunes was not working, and decided to perform only their own material. They were introduced to Decca staff producer Tony Clarke, who produced a recording session which saw Justin Hayward's "Fly Me High" and Mike Pinder's older-styled "Really Haven't Got the Time" (Decca F12607) as the 'Mark Two' Moodies' first single released in May 1967. These picked up both radio airplay and favourable reviews, but failed to chart in the UK. However, the sound gave clues about the direction in which their music would evolve. Their new style, featuring the symphonic sounds of Pinder's mellotron, was introduced on Pinder's song "Love And Beauty" (Decca F 12670) which was issued as a single c/w with Hayward's rocker "Leave This Man Alone" in September 1967. This too was not a UK hit, but further established their "new" Moodies identity. Ray Thomas's flute had been in evidence earlier ("I've Got a Dream") on their debut album; however, it became a far more featured instrument from this point onwards as they started incorporating distinct psychedelic influences, which was later developed in a concept album revolving around an archetypal day in the life of everyman. The Moody Blues' contract with Decca Records was set to expire and they owed the label several thousand pounds in advances. The second album had never materialised either. They had the support, however, of Decca A&R manager Hugh Mendl, who had been instrumental in the recent establishment of London/Decca's new subsidiary imprint Deram Records. With Mendl's backing, the Moody Blues were offered a deal to make a rock and roll version of Antonín Dvořák's New World Symphony to promote the company's new Deramic Stereo Sound audio format in return for which the group would be forgiven their debt. The Moody Blues agreed, but insisted that they be given artistic control of the project, and Mendl (as executive producer) was able to provide this despite Decca's notoriously tight-fisted attitude to their artists. The group was unable to complete the assigned project, which was abandoned. However, they managed to convince Peter Knight, who had been assigned to arrange and conduct the orchestral interludes, to collaborate on a recording that used the band's original material instead. Although Deram executives were initially sceptical about the hybrid style of the resulting concept album, Days of Future Passed (released in November 1967) became one of the most successful pop/rock releases of the period, earning a gold record award and reaching No. 27 on the British LP chart. Five years later it reached No. 3 in the US/Billboard charts. The LP was a song cycle or concept album that takes place over the course of a single day. The album drew inspiration in production and arrangement from the pioneering use of the classical instrumentation by the Beatles, to whom Pinder had introduced the mellotron that year. It took the form to new heights using the London Festival Orchestra, a loose affiliation of Decca's classical musicians given a fictitious name, adding the term "London" to sound impressive, to provide an orchestral linking framework to the Moodies' already written and performed songs, plus overture and conclusion sections on the album, including backing up Graeme Edge's opening and closing poems recited by Pinder. Strings were added to the latter portion of the album version of Hayward's "Nights in White Satin" (absent on the single) but the orchestra and group never performed together on the recording, with the band's rock instrumentation centred on Pinder's mellotron. Despite being a lush concept album, the LP was cut in a very workmanlike manner, with the band recording a particular song, then the track being presented to Peter Knight who quickly composed a suitable "linking" orchestral portion, which the Decca musicians ("London Festival Orchestra") then recorded. The album was as much an original work by Knight himself as the group. The composing credits were listed on the sleeve as: "Redwave-Knight", although Hayward wrote "Nights..." and "Tuesday Afternoon", Thomas provided "Another Morning" and "Twilight Time", Lodge penned "Peak Hour" and "Evening (Time To Get Away)", and Edge contributed the opening and closing poems (the first "Morning Glory" and the latter titled "Late Lament") read by Mike Pinder who composed both "The Sun Set" and "Dawn is a Feeling" (sung by Hayward, with Pinder singing the bridge section). Clarke produced the album, and afterwards continued working with the band. Sometimes known to fans as "The Sixth Moodie", he produced their albums and singles for the next eleven years. Engineer Derek Varnals also contributed heavily to the creation of the early Moody's studio sound, working with Pinder and Clarke to create a more symphonic overlapping sound on the mellotron as opposed to the sharp 'cut off' the instrument normally gave, partly achieved by removing all the "sound effects" tapes (trains, whistles, cockerel crowing, etc.) and then 'doubling up' the tapes of orchestral instruments' sounds, which combined with Pinder's ability and sensitivity at playing (Pinder having earlier worked for the company that manufactured the mellotron) and Varnals' recording skills at creating an orchestral 'wave' sound that characterised their non-orchestra accompanied sound thereafter. The album, plus two singles therefrom, "Nights in White Satin" and "Tuesday Afternoon" (as a medley with "Forever Afternoon," listed as "Forever Afternoon (Tuesday?)" on the album), took time to find an audience. In the Moody Blues' native Britain, the two singles from the album didn't initially catch on; "Nights in White Satin" made only No. 19 on the British singles chart in early 1968, and "Tuesday Afternoon" didn't chart at all. However, the British public learned to appreciate "Nights in White Satin" subsequently; it made No. 9 on the UK singles chart on re-issue in December 1972 and No. 14 on the charts on another reissue at the end of 1979, and is now regarded as the Moody Blues signature song by British audiences. In the US, "Nights in White Satin" did not make the Billboard Hot 100 in 1968, although it reached No. 2 on re-release in 1972; "Tuesday Afternoon" was more successful on initial release stateside, peaking at No. 24 on the Billboard Hot 100. The 1968 follow-up LP, In Search of the Lost Chord included "Legend of a Mind", a song written by Ray Thomas in tribute to LSD guru Timothy Leary which encompassed a flute solo performed by Thomas – four members of the group had taken LSD together at the start of 1967. A promotional film for the song was filmed on location at Groot-Bijgaarden Castle near Brussels in Belgium. Lodge provided a two-part song "House of Four Doors" set either side of Thomas' epic piece. Justin Hayward began playing sitar and incorporating it into Moody Blues music ("Voices...", "Visions of Paradise", "Om", etc. ), having been inspired by George Harrison. Hayward's "Voices in the Sky" charted as a single in the UK (No. 27), as did Lodge's "Ride My See-Saw" (No. 42, No. 15 in France) – still their concert finale number – which featured Pinder's non-album song "A Simple Game" as the 'B' side. Pinder's "The Best Way to Travel" was another high point, as was his closing song "Om" (sung by Pinder and Thomas, again featuring Hayward on sitar). Graeme Edge found a significant secondary role in the band as a writer of poetry, and some of their early albums from the late 1960s began with various band members reciting poems by Edge that were conceptually related to the lyrics of the songs that followed. Edge narrated his brief "Departure" poem on "Lost Chord", although Pinder recited the majority of Edge's poetry, as according to Edge, he had the best voice for it due to smoking more cigarettes and drinking more whisky at the time. On 1969's On the Threshold of a Dream, Hayward, Edge and Pinder share the opening narration on Edge's "In The Beginning", leading into Hayward's "Lovely To See You". His "Never Comes the Day" was issued as a UK single, while Thomas' wry observations of life in "Dear Diary" and "Lazy Day" were striking features. Pinder contributed the closing track on side one, "So Deep Within You". Side two closed with the "Dream Sequence", Edge's poem "The Dream" leading into Pinder's "Have You Heard?" parts I and II with the two parts separated by his classically themed instrumental piece "The Voyage". The band's music continued to become more complex and symphonic, with heavy amounts of reverberation on the vocal tracks, resulting in 1969's To Our Children's Children's Children — a concept album inspired by the first moon landing. The opening track "Higher and Higher" saw Pinder simulate a rocket blast-off on keyboards, then narrate Edge's lyrics. Thomas' "Floating" and "Eternity Road" stood out, as did Hayward's "Gypsy" and a rare Pinder-Lodge collaboration "Out and In". Lodge provided his two-part "Eyes of a Child" and "Candle of Life" while Pinder contributed "Sun is Still Shining". The album closed with "Watching and Waiting", composed by Ray Thomas and Justin Hayward and sung by Hayward. It was during 1969 that the band established their own label "Threshold" under licence to Decca Records. To Our Children's Children's Children was the first of their albums to be released on their own label. The song "Watching and Waiting" was issued as a single on the Threshold label, but failed to chart. Although the Moodies had by now defined a somewhat psychedelic style and helped to define the progressive rock (then also known as 'art rock') sound, the group decided to record an album that could be played in concert, losing some of their full-blown sound for A Question of Balance (1970). This album, reaching No. 3 in the American charts and No. 1 in the British charts, was indicative of the band's growing success in America. Incidentally, it seems to have been one of the first rock albums broaching the issue of ecology (e.g. line: We'll spoil the seas with the rivers we've lost, from Edge's "Don't You Feel Small"). Hayward's "Question" (in a differing version) was issued as a single, reaching No. 2 in the UK (kept from the top spot only by the England World Cup football team's novelty record "Back Home"). Justin Hayward began an artful exploration of guitar tone through the use of numerous effects pedals and fuzzboxes and developed for himself a very melodic buzzing guitar-solo sound. The Moody Blues had by now become a bill-topping act in their own right. They appeared twice at the famous Isle of Wight Festival (A DVD of their 1970 performance has been released). Pinder's "Melancholy Man" (a No. 1 single in France) stood out beside Hayward's "Question" on the 1970 album. For their next two albums, Every Good Boy Deserves Favour (1971) – from which Hayward's "The Story in Your Eyes" was taken as a US charting single (No. 23) - and Seventh Sojourn (1972) (which reached No. 1 in the US), the band returned to their signature orchestral sound which, while difficult to reproduce in concert, had become their trademark. The title "Every Good Boy Deserves Favour" was borrowed, tongue-in-cheek, from a mnemonic used to remember the musical notes that form the lines of the treble clef: EGBDF. The opening track "Procession" was the only item composed by all five band members, a fascinating track depicting the "evolution" of music, leading into Hayward's "Story in Your Eyes". Thomas's reflective "Our Guessing Game" and whimsical "Nice To Be Here" offset the deeper drama of Hayward's "You Can Never Go Home", Lodge's "One More Time To Live" and Pinder's "My Song". Edge, the long-standing drummer-poet, started writing lyrics intended to be sung, rather than verses to be spoken – his "After You Came" (1971) featured each of the four lead singers taking a vocal section. Then in 1972, Lodge's songs "Isn't Life Strange?" (No. 13) and "I'm Just a Singer (In a Rock and Roll Band)" (No. 36) were lifted from "Seventh Sojourn" as charting UK singles. "Sojourn" also saw Pinder using the new Chamberlin instrument in place of the mellotron and Edge using an electronic drum kit. Pinder's stirring lament "Lost in a Lost World" opened this last "Core Seven" outing, while his sympathetic ode to Timothy Leary "When You're a Free Man", Thomas's romantic "For My Lady", and Hayward's serene "New Horizons" all stood out. In an interview following the release of Seventh Sojourn, Graeme Edge told Rolling Stone: "We've got two Christians, one Mystic, one Pedantic and one Mess, and we all get on a treat." By this time, other bands were picking up their work. Pinder's songs "A Simple Game" (1968) and "So Deep Within You" (1969) were successfully covered by the Four Tops, Pinder winning an Ivor Novello Award for "A Simple Game", Elkie Brooks later covered Hayward's "Nights in White Satin". Pinder also appeared on John Lennon's "Imagine" album in 1971, providing additional percussion on "I Don't Wanna Be a Soldier (I Don't Want to Die)". The 1968 to 1972 album sleeves, plus several solo sets up to Ray Thomas's "Hopes, Wishes & Dreams" in 1976, were characterised by striking surreal scenic sleeve artwork (mostly gatefold sleeves) by artist Phil Travers. In late 1972, a re-issue of the five-year-old Nights in White Satin became the Moody Blues' biggest US hit, soaring to number two on the Billboard Hot 100 and becoming a certified million-seller; the song had "bubbled under" the Hot 100 charts on its original release. The song also returned to the UK charts, reaching No. 9, ten places higher than its original release in 1967. The Moodies were also among the pioneers of the idea that a successful rock band could promote itself through their own label, following the Beatles' creation of Apple Records. After their On the Threshold of a Dream album (1969), they created Threshold Records, prompted in part by disputes with London/Deram over album design costs (their gatefold record jackets and expensive cover art were not popular with company executives). The idea was for Threshold to produce new albums and deliver them to London/Decca who would act as distributor. 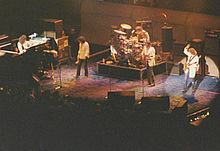 The group attempted to build Threshold into a major label by developing new talent —most notably the UK hard rock band Trapeze and the Portland, Oregon, classical-acoustic sextet Providence —but these efforts were unsuccessful and the Moodies eventually returned to more traditional recording contracts. However, they helped lay groundwork for other major acts to set up similar personal labels and distribution deals, including the Rolling Stones' own label and Led Zeppelin's Swan Song, and all of the Moodies' studio releases from 1969 to 1999 bore the Threshold logo on at least one of their format versions. In the spring of 1974, after completing a vast world tour that culminated with a tour of Asia, the group took an extended break, erroneously reported as a break-up at the time, because of the other band members feeling exhausted and overshadowed (this was said by Hayward in the final issue of Higher & Higher magazine 2006). Although the band had typically featured four lead vocalists (with Edge also contributing vocally), Hayward was the principal guitarist/vocalist whilst Pinder was considered to be the person most responsible for their symphonic sound, arrangements, and overall conceptual direction. Pinder and Thomas also doubled as the Moodies' onstage MCs (as the 1969 "Caught Live + 5" album displayed). Before the band's 1973–74 world tour (their last with Pinder), Hayward wrote a song called "Island" with the intention of including it on a potential follow-up album, which the Moodies recorded in 1973 before ultimately going their separate ways.An additional cause of the hiatus were the long tours that had by this time strained Pinder, who needed a rest. In 1974 the band oversaw preparation of the compilation album This Is The Moody Blues which was released that year. Hayward and Lodge released a duo album, the very successful Blue Jays (1975), and a UK chart single, "Blue Guitar" (no. 8), which was credited to Hayward and Lodge even though it was just Hayward with 10cc backing him. 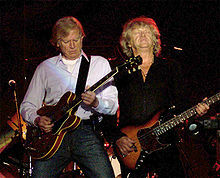 The album had originally been a projected liaison between Hayward and Pinder, but after Pinder dropped out, John Lodge stepped in. (Tony Clarke produced it.) The members then released solo albums. Pinder said he hoped to get the band back together that year. "Having moved to California in 1974, I returned to Britain for a visit in summer 1975. I was trying to get the band to do an album, but the response was so weak I returned to California with my two new Mk5 mellotrons and began work on my solo album The Promise." Edge produced two albums with guitarist Adrian Gurvitz, Kick Off Your Muddy Boots (1975) and Paradise Ballroom (1976); Hayward composed the acoustically textured Songwriter (1977), which was followed up in later years by Night Flight (1980), Moving Mountains (1985), (which Hayward dedicated to Peter Knight) Classic Blue (1989), The View From The Hill (1996) and Live in San Juan Capistrano (1998); Lodge released Natural Avenue (1977); Pinder produced The Promise (1976); and Thomas collaborated on two projects with songwriter Nicky James, producing From Mighty Oaks (1975) and Hopes, Wishes and Dreams (1976). In 1977, the group made a decision to record together again, with their record company Decca urging a reunion album. London Records decided to release a somewhat poorly mixed eight-year-old recording of the band performing at London's Royal Albert Hall, against their artistic wishes. London/Decca did this in an attempt to re-energise public interest in the Moody Blues before their anticipated new album, but by this time Pinder had remarried and started a family in California, so for their reunion recording, the band decamped stateside with producer Clarke. The sessions were marked with tension and division: first there was a fire at the studios they were using, then after quickly relocating to Pinder's home studio, a landslide following torrential rains effectively marooned them, inevitably causing tensions to rise (with Pinder then dropping out before completion). Clarke was also forced to leave because of non-musical reasons before the album was completed, but by the spring of 1978 Octave was ready for release. Pinder, citing his young family, and by then probably considering the band's touring days behind them, excused himself from the touring commitments that were to follow. His decision caused acrimony within the band (notably from Edge) and Ray Thomas had said Pinder was initially agreeable to touring, but his opting out later on (with a major comeback tour already planned) was a severely embarrassing blow to them. Attempts were made by their management to downplay Pinder's absence, notably at a major UK music press party Decca organised, when the top Decca dignitary guest, while making a "welcome back" speech, openly referred to "Mike Pinder being currently absent over in the States", much to their dismay. During this period, the prog-rock band Yes had asked their Swiss-born keyboardist, Patrick Moraz, to leave. Moraz's management had some contacts with the Moodies, and after a successful audition with the band in England in 1978, he was engaged as keyboardist for the Octave World Tour that began in Germany in October. The album sold well and produced the hits "Steppin' in a Slide Zone", (no. 39 US) written by Lodge and "Driftwood", (no. 59 US) written by Hayward. The music video produced for "Driftwood" featured Moraz, although Pinder was the one who played on the actual recording; the video for "Steppin' in a Slide Zone" simply showed the other four members without Pinder (which was rather awkward as Pinder's keyboards featured extensively on the song, notably on the distinctive intro and during a solo section of the piece). A group performance of Hayward's "Had to Fall in Love" and Lodge's "Slide Zone" on the "Kenny Everett Show" also depicted them as a four piece. On Octave, Hayward had some four solo composed songs (more than on "The Other Side of Life" later in 1986), Edge contributed "I'll Be Level With You" (aka "Little Man") one of only a few songs showing a complete group unity. Several songs sounded like solo efforts, while Lodge's "Survival", Hayward's appropriate closing "The Day We Meet Again" and Pinder's final contribution and lead vocal, "One Step into the Light" (curiously as the band is depicted as doing so on the cover photo – where Pinder is perhaps significantly barely glimpsed at all and almost out of focus) were all high points on the album. Around this time, Justin Hayward enjoyed a solo hit (No. 5) in the UK (US No. 47) with the song "Forever Autumn" from Jeff Wayne's Musical Version of The War of the Worlds. In recent times Hayward has sung both this and "The Eve of the War" live in the touring version of the album, as featured on Wayne's original big-selling double album. The Moody Blues toured the US and Europe during much of 1979. A live CD The Moody Blues Live in Seattle 1979 during the Octave tour of a concert at Seattle Center Coliseum recorded on 25 May 1979 was later issued in 2013. By 1980 they were ready to record again, this time bringing in producer Pip Williams. Moraz was retained as the band's permanent keyboardist, though Pinder had originally understood that he would continue to record even if not touring with the band. Pinder took legal action to prevent the new Moody Blues album from reaching the public without his contributions, but he was not successful, and ultimately, he never returned to the fold. Nevertheless, when released in 1981, Long Distance Voyager was a colossal success, reaching No. 1 on Billboard and going Top 5 in the UK. The album yielded two hits, "The Voice", (No. 15 US) written by Hayward, and "Gemini Dream", (No. 12 US) written by Hayward and Lodge. John Lodge's "Talking out of Turn" also charted in the US, reaching No. 65. Edge provided "22,000 Days" (featuring Thomas as lead voice with Hayward and Lodge) while Thomas' contributions were the final portion of the set with his singing on the final two songs; "Painted Smile", "Reflective Smile" (a poem narrated by a DJ friend of the band) and "Veteran Cosmic Rocker". By now, the mellotron had long been set aside as their primary keyboard instrument on their studio albums and the band embraced a more modern, less symphonic approach, though still retaining a lush keyboard-led sound as Moraz gave a more contemporary edge. In live concerts, the mellotron was still used heavily by Moraz until the mid-1980s, including on songs that did not originally feature it. The Present (1983), again produced by Williams, was less successful than its predecessor, though it spawned a UK Top 40 hit (No. 35) in "Blue World" (No. 62 in the US) and a US Top 40 hit in "Sitting at the Wheel" (which failed to chart in the UK). Videos were also produced for both singles. The Present was released in conjunction with Talencora Ltd shortly before Decca was bought out by Polydor Records. In 1986 they enjoyed renewed success with their album The Other Side of Life and in particular with the track "Your Wildest Dreams" – a US Top 10 hit (and No. 1 on Billboard's Adult Contemporary singles chart for two weeks) which garnered a Billboard Video of the Year award after being frequently featured on MTV. It made them "the first act in history to earn each of its first three top 10 singles in a different decade" (along with Go Now in 1965 and Nights In White Satin in 1972). Newly employed producer Tony Visconti and Barry Radman, a synth programmer formerly engaged by Moraz, delivered a modern sound the Moodies had been seeking in order to remain competitive with their pop contemporaries and the album's title song also charted in the US, at No. 58. The renewed interest in the band ensured a younger audience, with many of their longtime followers remaining loyal despite a fair number of older fans finding the albums of this period far more lightweight in content - for example, Lodge had gone from writing powerfully reflective mystical or humanitarian themed pieces such as "House of Four Doors", "Candle of Life" and "One More Time to Live" to quirkier items such as "Here Comes the Weekend", "Rock and Roll Over You" and "Love is on the Run (From Me)" while Hayward's songs seemed less the deeper drama of numbers such as "The Actor", "Dawning is the Day", "You Can Never Go Home", "The Land of Make Believe", etc., to pleasant (and more radio-friendly) perennial far simpler songs about lost love and romance ("Your Wildest Dreams", "No More Lies", "I Know You're Out There Somewhere" etc.). There were still some deeper songs being created by the band, ("The Voice", "22,000 Days", "The Other Side of Life", "The Spirit", "Deep", etc.) but the overall tone had noticeably become a more lightweight commercialised one; presumably this was with record company agreement to keep in accordance with the then prevailing times. Their live shows from this period included a good number of their 1980s album tracks. However, over time, more of the "Core Seven" album era favourites reappeared in their playlist, but Pinder's compositions were permanently retired from their setlists after his departure. The Moody Blues performed live at the Birmingham Heart Beat Charity Concert 1986 which raised money for Birmingham Children's Hospital. The band played four songs, and later provided backup with The Electric Light Orchestra for George Harrison. The Moodies continued their early video-generation success with Sur La Mer (1988) and its video and single, "I Know You're Out There Somewhere" (No. 30 US, No. 52 UK, No. 2 US Mainstream Rock), a sequel to "Your Wildest Dreams". Their sound took on an ever-increasingly synthetic and technical quality as Moraz and Visconti began using modern sequencers, samplers and drum machines. Hayward and Lodge wrote and sang on most of the songs as the band came under pressure from their new record company, Polydor Records, to promote those it deemed to be the two more commercial looking and sounding members and they decided to exploit that aspect rather than catering for the band as a whole or retaining the five-way songwriting methods the group had done with Pinder. By then, Ray Thomas was playing a diminished role in the recording studio with the band evolving into a synthpop act, a genre that was unsuitable for the use of a flute. Thomas provided additional percussion, notably a brisk tambourine, on many more Moodies songs which continued to be featured, plus occasional harmonica, but by this point he was largely relegated to the status of a backup singer and he was also unwell during this period, further limiting his involvement with the band in the recording studio. Thomas provided some backing vocals for both The Other Side of Life and Sur La Mer; however, for reasons unclear, multiple production considerations led Visconti to leave Thomas' vocals off the latter of these two albums, thereby further reducing the texture of their overall vocal sound, which had previously been rich four-part harmonies (Hayward, Lodge, Thomas and Pinder), then went down to three (Thomas, Lodge and Hayward) upon Pinder's departure and reduced still further to just the more similar-sounding voices of Hayward and Lodge (Lodge also providing falsetto vocals and high harmonies), with Pinder and Thomas each having provided both lower and higher-pitched vocal harmonies in the group's earlier vocal sound. The band's vocal "sound" had become the blend of just Hayward and Lodge, which was still recognisable, if less textured than the original four-part, more complex "choral" sound. Moraz was displeased with Visconti's exclusion of Thomas from the final release of Sur La Mer and accused him of tailoring the album for radio, as revealed in a 1989 newspaper article where it revealed Moraz's anger with the state of the band and at Visconti in particular. Despite his diminished participation in the recording process, Thomas' high value remained on stage primarily from his continued ability to sing out his 1960s and 1970s Moodies classics, and also in flute and keyboard duets he composed with Moraz which were performed only during Moodies' concerts. The band had begun to reinforce their concert sound in 1986 with the addition of a second keyboardist. (Bias Boshell was the first, replaced in 1987 by Guy Allison before Boshell returned by 1990), as well as female backing singers (see personnel below). In 1991, halfway through the production of their new studio album, Patrick Moraz did an interview with Keyboard Magazine and made some comments in the article that suggested dissatisfaction with his role in the Moodies. His complaints ranged from the Moodies' music becoming too simple in structure to the other members' reluctance to allow him to make significant contributions to the songwriting on their albums. He also was occupied with spending large amounts of time planning a music concert to celebrate his native Switzerland's 700th anniversary instead of rehearsing with the Moodies and as a result, he was fired from the group before the project was completed, so Boshell and new keyboardist Paul Bliss were brought in to finish the new album's keyboard tracks. Despite previous credits as an "official band member" and being included in group photos on the four '80s studio albums from "Long Distance Voyager" to "Sur La Mer", subsequent Moodies compilations downplay Moraz to being merely an "additional keyboardist" and several band photos have him cropped or airbrushed out, notably on the covers to Gold (which didn't even mention him in the booklet liner notes, let alone include his picture) and the more recent compilation "Polydor Years 1986-1992". Moraz later took legal action against the group in the United States and the lawsuit, which he won, was shown on Court TV, but he was awarded only $77,175 in back pay due to accounting slow-ups instead of the $4,000,000 he sought. Keys of the Kingdom, released in 1991, had modest commercial success when released and once again, Hayward's songs led off the album, with the new singles "Say It with Love" and "Bless the Wings (That Bring You Back)." Also included was a new ambient flute piece by Ray Thomas entitled "Celtic Sonant." Hayward and Thomas also co-wrote "Never Blame the Rainbows for the Rain" to close the album. Lodge made a defining shift in his songwriting on this album, leaving his trademark high-energy rock music, and instead gravitating towards slow love ballads such as "Lean on Me (Tonight)" (though he had earlier contributed some songs in this gentler vein such as "Emily's Song" for his daughter in 1971, "Survival" in 1978, and "Talking Out of Turn" in 1981), while his more powerful songs continued with "Magic" and the Lennonesque "Shadows on the Wall". This gentler trend continued on the two successive Moodies albums. Hayward wrote the driving two-part piece "Say What You Mean." Tony Visconti produced some of the tracks on "Keys", as did Christopher Neil and Alan Tarney. The ensuing tour saw them invited to play at the Montreux Jazz Festival. A non-album Hayward-Lodge song cut at these sessions, "Highway", was included on the "Say It with Love" twelve-inch single and on a later box set and compilation album, while the vinyl album did not include their song "Once is Enough" as on the compact disc version. The group remained a steady concert draw, and a series of video and audio versions of their 1992 Night at Red Rocks concert enjoyed great success, particularly as a fund-raiser for American public television where it had been first broadcast. The concert was conducted and arranged by Larry Baird, who has participated in many other bands' orchestral live concerts, such as Kansas, Michael Bolton, Three Dog Night, Al Jarreau and Alan Parsons. The group also continued their use of additional musicians on stage and in the studio, but after the two legal suits from both Pinder in 1981 and Moraz in 1992, the band was careful not to recognise future keyboardists as official members. Following on from his contributions as keyboardist on the 'Keys of the Kingdom' album, Paul Bliss continued to play keyboards for the band live, being promoted to first keyboardist in 2001 (but was replaced in March 2010 after 19 years continuous service). Thomas and Bliss continued the tradition of a flute/keyboard duet for many tours. After Edge injured himself in 1991, second drummer Gordon Marshall was brought in to back him up; he stayed with the group after Edge returned and remained in the position until autumn of 2015 when he left to play in a Moody Blues cover band "Legend of a Band" and another cover band "Reflections". From 1991 to 1998 the group took a hiatus from recording and spent time trying to perfect the art of performing live with an orchestra. The recording hiatus ended in 1999, with the album Strange Times, their first album in almost two decades to be more than moderately received by British critics, although Justin Hayward was quoted as saying he was disappointed at the album's chart performance – probably not helped by the long recording hiatus – which was notably less than "Keys of the Kingdom" in 1991. It was recorded in Recco, Italy, at Hayward's suggestion, and was the band's first self-produced effort. The album featured keyboards and arrangements from Italian musician Danilo Madonia, who continued to work in-studio with the band. The album opened with English Sunset, a pop song featuring a modern, nearly techno arrangement. The song This is the Moment (which is not on Strange Times), which was originally featured in the Broadway production of Jekyll and Hyde, was a minor hit in the US. Strange Times was also the first album since 1970 to include a new poem by Graeme Edge, Nothing Changes, narrated by Edge, with Hayward then singing the concluding portion of the track, and notably concluded by quoting Mike Pinder's 1968 song title A Simple Game. Also in 1999, the Moody Blues appeared in one episode of The Simpsons called Viva Ned Flanders. On Strange Times Ray Thomas appeared vocally with Hayward and Lodge on Sooner or Later (Walkin' on Air) and his own brief song My Little Lovely, plus provided a vocal snippet and backing vocals on Hayward's English Sunset; this was his recorded vocal swan song with the band. In 2001 an IMAX film was released entitled Journey into Amazing Caves, which featured two new songs written and performed by the Moody Blues. The soundtrack also featured Justin Hayward performing vocals and playing guitar throughout. One of these songs, entitled Water, is the Moody Blues' first instrumental studio recording since their 1983 piece Hole in the World from The Present LP. The new millennium saw the Moody Blues reducing their touring schedule. At the end of 2002, founding member Ray Thomas retired from the group, reducing the Moody Blues to the trio of Hayward, Lodge and Edge, the last being the only original member. Flautist and rhythm guitarist Norda Mullen was recruited early the following year for their North American tour, and has worked with the band live and in the studio since then. Toward the end of 2003, they released an album entitled December. The songs included originals and four covers: John Lennon's "Happy Xmas (War Is Over)", Mike Batt's "A Winter's Tale", "When A Child is Born" and Irving Berlin's "White Christmas". December was the group's first album to include covers since their 1965 debut album The Magnificent Moodies. In March 2006, the first five of the band's 'Core Seven' albums (the seven albums from Days of Future Passed to Seventh Sojourn) were re-released in SACD format with Deluxe Editions, featuring bonus songs and some rare previously unreleased tracks. In April 2007, the last two of these classic albums were re-released by Universal/Threshold. These deluxe editions were unique for an art rock group like the Moodies in that one of their members, Justin Hayward, was the one taken on to do the work, instead of a professional master technician. Hayward stated that he listened to virgin vinyl copies of these albums and used them as reference points for the new compact discs. On 21 May 2007 the Moodies released a forty-one track, two-disc compilation of sessions recorded at BBC Studios, various television appearances and a previously 'lost' performance done on the Tom Jones Show titled Live at the BBC: 1967-1970. In 2007, the now defunct Hard Rock Park theme park in Myrtle Beach, South Carolina, announced the building of a dark ride entitled "Nights in White Satin: The Trip". The ride incorporated multi-sensory experiences as well as a re-orchestrated version of the song by Justin Hayward. A re-recorded version of Graeme Edge's "Late Lament" again followed, which had each group member reading a verse of the poem. In March 2009, the ride closed because of the conversion of the park to the Freestyle Music Park, with the new owners desiring to make the park more "family friendly." The group toured the UK, Canada and the US in 2006, 2007, 2008, 2009 and 2010. In addition, Hayward took part in the UK tour of Jeff Wayne's Musical Version of The War of the Worlds in April 2006, and a second tour in November 2007, also with dates in 2009. The Moody Blues also toured Australia and New Zealand in 2006. Their long-time producer, Tony Clarke, died in January 2010. The band added keyboardist Alan Hewitt for their 2010 UK and North American tours. The Moody Blues are members of the Vocal Group Hall of Fame. They have never been nominated for the Rock and Roll Hall of Fame; in 2013, readers of Rolling Stone voted for them as one of the ten bands that should be inducted. Ultimate Classic Rock has called them "perennial victims of an unaccountable snubbing" and inducted them into its own Hall of Fame in 2014. The Moody Bluegrass project is a group of Nashville artists who have recorded two tribute albums of Moody Blues songs in the bluegrass style. The first album, Moody Bluegrass – A Nashville Tribute to the Moody Blues, was released in 2004. Those involved included Alison Krauss, Harley Allen, Tim O'Brien, John Cowan, Larry Cordle, Jan Harvey, Emma Harvey, Sam Bush and Jon Randall. A second Moody Bluegrass album, Moody Bluegrass Two...Much Love, was released in 2011. In addition to many of the participants of the first album, a number of tracks included guest performances from Hayward, Lodge and Edge, (each of whom is credited as the lead vocalist on one song) plus Thomas and Pinder, making this the first time since 1978 that these five musicians all appeared on one newly recorded album. ^ a b James E. Perone (2009). Mods, Rockers, and the Music of the British Invasion. ABC-CLIO. p. 130. ISBN 978-0-275-99860-8. ^ a b c d Michael Ray, ed. (2012). Disco, punk, new wave, heavy metal, and more: Music in the 1970s and 1980s. Rosen Education Service. p. 107. ISBN 978-1615309085. ^ Nicholas E. Tawa (2005). Supremely American: Popular Song in the 20th Century: Styles and Singers and what They Said about America. Scarecrow Press. p. 248. ISBN 978-0-8108-5295-2. ^ Doyle Greene (10 March 2014). The Rock Cover Song: Culture, History, Politics. McFarland. p. 124. ISBN 978-1-4766-1507-3. ^ Macan, Edward (2005). Endless Enigma: A Musical Biography of Emerson, Lake and Palmer. Open Court. p. 78. ISBN 978-0-8126-9596-0. ^ a b c Eder, Bruce (2009). "The Moody Blues: Biography". AMG [All Music Group, a subsidiary of Macrovision]. Retrieved 28 July 2009. ^ a b Greene, Andy (24 April 2013). "Readers' Poll: 10 Bands Who Should Enter the Rock and Roll Hall of Fame in 2014". Rolling Stone. Retrieved 25 August 2015. ^ Parker, Matt (25 July 2013). "Justin Hayward on The Moody Blues and writing in corners". MusicRadar. Retrieved 27 August 2015. ^ "Interview With Mike Pinder". Classicbands.com. Retrieved 2015-08-26. ^ "Moody Blues - British Invasion Bands". britishinvasionbands.com. ^ "Denny left on Saturday and we´re not sure what we´re going to do. We´re waiting to see Brian Epstein to talk things over with him." Ray Thomas, as quoted by Record Mirror, 8 October 1966: . Epstein, however, dropped the band almost immediately (same website). ^ see article  on Tony Brown´s website, taken from Hit Week #10, November 1966, page 5. ^ "I wasn't content to just carry on this gig just to bring money in. Our management thing had all fallen apart. We'd gone with Epstein and that was a disaster." Laine interviewed by Mark Murley in Higher & Higher # 36, 1997, page 18. ^ Obituaries – Hugh Mendl: Producer at Decca Records; The Independent, 25 July 2008. ^ "Show 49 - The British are Coming! The British are Coming! : With an emphasis on Donovan, the Bee Gees and the Who. [Part 6]: UNT Digital Library". Digital.library.unt.edu. 2015-08-21. Retrieved 2015-08-26. ^ "Moody Blues drummer Graeme Edge interviewed - TechnologyTell". TechnologyTell. ^ Author. "Threshold Records (The Shop) in Moody Blues Hall Forum". Travellingeternityroad.yuku.com. Retrieved 2015-08-26. ^  Archived 20 June 2007 at the Wayback Machine. ^ "Stepping In A Slide Zone – LIVE". YouTube. 15 May 2011. Retrieved 17 April 2012. ^ "The Moody Blues: In Review • Sur La Mer (1988)". Runstop.de. 2006-09-30. Retrieved 2015-08-26. ^  Archived 14 August 2007 at the Wayback Machine. ^ "The Moody Blues: Live at the BBC: 1967-1970". Webbeta.sov.uk.vvhp.net. Retrieved 2015-08-26. ^  Archived 7 August 2007 at the Wayback Machine. ^ "The Moody Blues Cruise • April 2 - 7, 2014 -". moodiescruise.com. ^ Giles, Jeff (30 December 2014). "Moody Blues Inducted Into the Ultimate Classic Rock Hall of Fame". Ultimate Classic Rock. Retrieved 27 August 2015. ^ Chapman, Rob (17 September 2015). "The Moody Blues – psychedelia's forgotten heroes". The Guardian. London. Retrieved 22 August 2016. ^ "Two Much Love: Moody Bluegrass 2". Twomuchlove.com. Retrieved 2015-08-26.